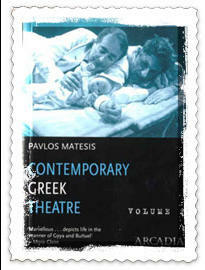 Pavlos Matesis enjoys an international reputation as a playwright, novelist and translator. His novels have been translated into more than ten languages and have been loved by readers from around the world. This volume though is his first presence in the English language and the first presentation of his theatre plays outside Greece. Arcadia Books will publish very soon his internationally best selling novel “The Daughter”.